Weightier Matters: Why President Jonathan of Nigeria Conceded Defeat:As for me, as a matter of principle, it is always the nation first". Why President Jonathan of Nigeria Conceded Defeat:As for me, as a matter of principle, it is always the nation first". "Since I assumed duty, I have been involved in quelling political crises in some African countries and I know what they passed through and what some are still going through. If you scuttle a system for personal ambition, it becomes a collective tragedy. You need to have a nation before you can have an ambition. It should always be the nation first. You don’t have to scuttle national progress for personal ambition. Democracy has to be nurtured to grow. Strong democratic institutions are the backbone and future of our democracy. They must be protected and nurtured. As for me, as a matter of principle, it is always the nation first". “President Francois Hollande was our guest in Nigeria during the celebration of Nigeria’s centenary. He has been very supportive of the country in the fight against terrorism. I expect that the same warmth and goodwill will be extended to the incoming government. “I expect that France will continue to work with the new administration, especially on issues of terrorism. The United Nations has been supportive as well. Our troops, supported by regional forces, have done very well in fighting the terrorists in recent times. 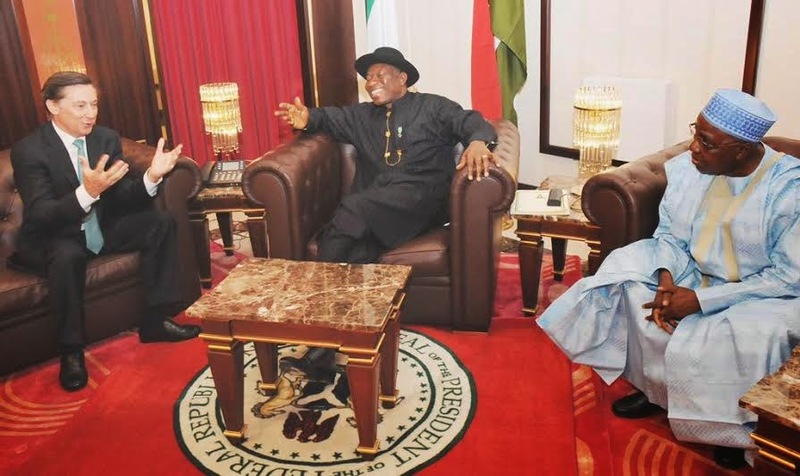 What we need now is support to help our people get back their lives"
President Jonathan said this when he received the new French Ambassador to Nigeria, Denis Guaer at the state house in Abuja yesterday April 16,2015.